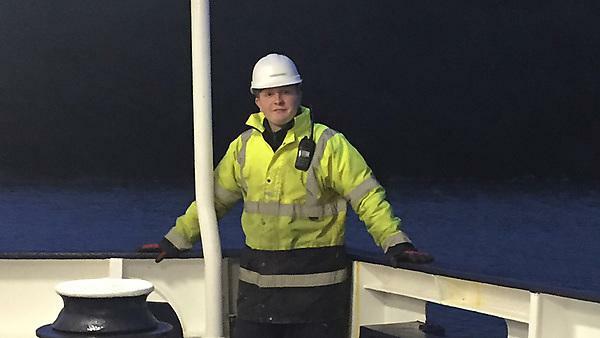 Since graduating in 2016, James Edwards has gone on to work as a Second Officer for Faversham Ships Limited. I am currently a Second Officer working for Faversham Ships Limited, a UK based company that runs coasters in and around Europe. The current vessel that I work on is the ‘M/V Vitality.’ She is 2834 GT and has a 90 m LOA. Her normal cargo is ‘maize,’ although she can and has carried scrap metal, fertiliser, and other bulk cargoes. I am currently sailing as the Navigation Officer (as the Second Officer I had both 12 – 4 watches aided by a lookout). Whilst not on my two watches I completed passage plans, ensuring the route the vessel sailed was a safe, efficient, and complied with local and international regulations. I was also in charge of the bridge equipment, Lifesaving appliances, Fire Fighting Equipment, the Global Maritime Distress and Safety System (GMDSS), and the upkeep and correction of the publications and charts on board. Whilst in port I would also assist the Chief Officer with the loading and discharging of the cargo and ballast. The job itself has a natural progression path and I hope to sit my chief officer exam when I have the required sea time. I am confident that I would be capable of sailing as a chief mate. The course and the lecturers are a very powerful tool in preparing cadets for life as an officer: the wealth of experience and knowledge combined with the training in navigation, seamanship, and bridge watchkeeping has put me in a position where, as an officer, I am confident that I can take safe and appropriate action to ensure the vessel, the crew, and its cargo are safe at all times.